It was the summer of 2003 in the Outer Banks and my sisters and I were enrolled in a surf camp at what once was Bert’s Surf Shop, now OBBC. Every day for a few weeks we woke up early to drive down to Avalon Pier for our surf sessions. That summer was particularly special, for I was spending time in my favorite place learning to get better at surfing everyday. However, what really made that time most memorable, was this surf camp we took with pro-surfer, Jesse Hines, as one of our instructors, for in reality, it wasn’t your typical “surf camp.” Without sounding too preachy, our day would start out with a prayer on the beach where we would read a section of the Surfer’s Bible. For the first time, the meaning of connecting your spiritual side with the power of the ocean became crystal clear to me, and I never looked at the ocean the same again. As the camp session ended for the summer, we finished it off with an award ceremony (where I won best surfer of the camp!!) and the best North Carolina BBQ. That was also the moment we met Jesse’s other half – the gorgeous Whitney Hines. Not only were these two some of the best looking individuals I had ever met, but to me, they defined what "goodness” really means. It was clear that she was the ying to his yang and vice versa. 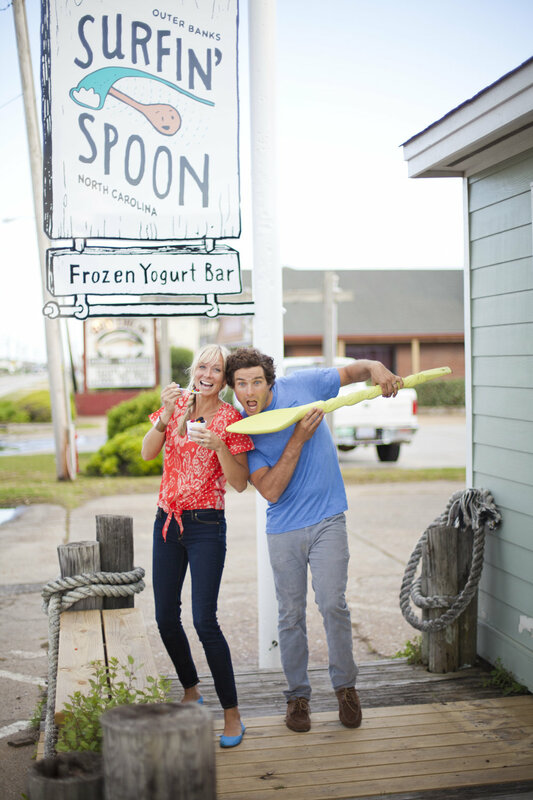 Since then, a lot of things have changed – Whitney and Jesse’s family has grown with the addition of 2 amazing boys and they opened the Surfin’ Spoon, aka the best froyo bar south of the Mason Dixon Line! 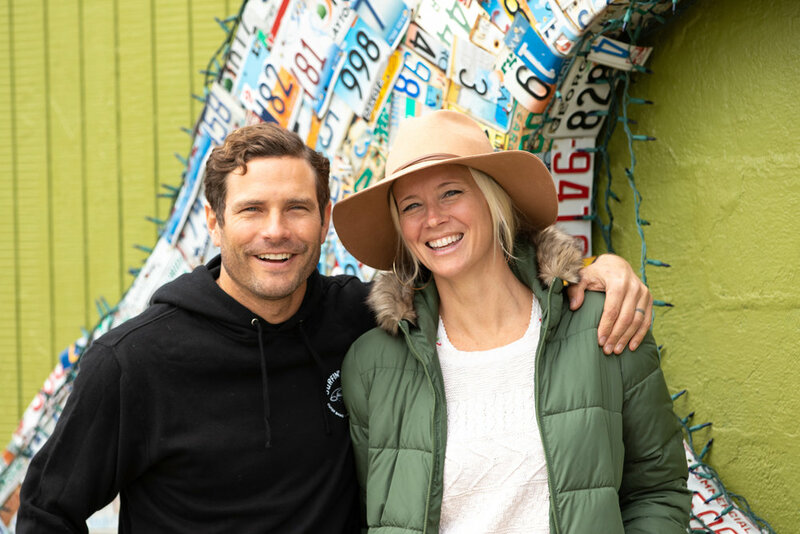 At the same time, and just as much as things have changed, one thing has stayed the same – Jesse and Whitney’s love and respect for each other. Whitney: I love this question, and telling the my version of the story never gets old! 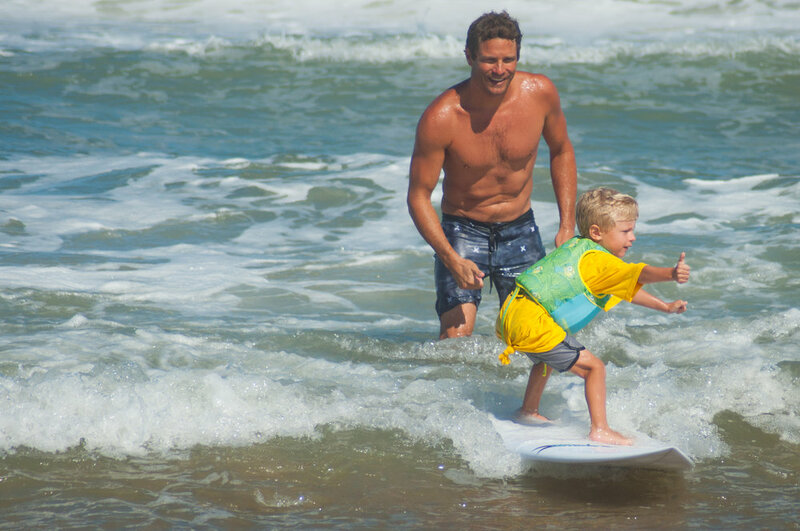 Here’s the short version: I’m from Wrightsville Beach, NC and he’s from the Outer Banks, NC but we had mutual friends that were in college at UNC Wilmington so he would come down to surf and hang out. One glorious day in 1996 (seniors in high school) we met on the beach when a friend introduced us. I was sitting in the sand and I turned around and locked eyes on the most gorgeous guy ever, like a movie, I literally dropped my jaw and stared barely squeaking out “hey”. He had a big curly blonde afro, bright blue eyes, and just all together dreamy. He was in his wetsuit about to paddle out in a surf contest and gave me a quick “hey”. We would see each other from time to time when he came in town, but it wasn’t until 2 years later that we actually dated (I even had posters of him hanging on my bedroom wall until then, haha). Both: On September 20, 1998, our first date was to a mediocre restaurant, then to see the “Rush Hour” movie, yes the first one... we are that old, haha, then we went to my dad’s dock on the sound and sat under the stars. It was romantic and great. We laughed a ton!! Was there a sign that you knew it was meant to be? Whitney: He finally fell in love with me during a hurricane when we were trapped inside for several days. We were already good friends but I suppose spending that much time together really made us get to know one another better. It wasn’t long, maybe a few weeks, before we knew we would get married one day. We could never see ourselves without each other in life. Jesse: True. And I remember riding in her boat (yes, she was the captain, haha) and looking over at her as the wind blew her blonde hair, and I quietly said to myself, “I love her”. Sounds cheesy, but it’s true. I had never said that to any girl or came close to feeling that way, so I knew I wanted to be with her forever. What is your favorite thing about one another? Whitney: Jesse is the kindest, sweetest, most gentle, generous, cute and funny person I’ve ever known. I adore him, and look up to him in just about every way, even after being together 20 years. He loves the Lord , and he loves me and our boys like I could have never dreamed. That was way more than one thing. I guess I love everything about him. Jesse: She is the absolute most caring and thoughtful person I have ever met in my life. I have never met anyone like her. And, she loves to surf!! Best advice for those looking to find love? Jesse: Don’t settle. God has a perfect person for you to spend your life with. Trust, and wait for them! Whitney: I agree. Never settle until you find the person that you can’t live without, and who helps you grow and become stronger too. Whitney: Attraction, communication, quick forgiveness, and quality time together is very important. But for us, we are Christians, so our faith is a huge part of our story and who we are, both together and separate. Our love starts with God, and He is always at the center of all we do and how we make decisions. How do you resolve your differences? Whitney: We try to be very honest, and resolve things quickly. It’s rare for either of us to stay angry longer than 5 minutes. Life’s too short to stay mad. Best advice for keeping the love/romance alive? Jesse: Its a must to spend time alone together as our family grows. It reminds us how much we love each other, and why we are still together after 20 years! Be sure to visit Surfin’ Spoon in OBX and snag some awesome merch in the meantime HERE!